Home Again: One Unforgettable Day! It started early Feb.13, 2010. 5:00 AM the alarm rings. "What, this is my birthday?" both gave us the time of our lives. "FUN FUN FUN" Bus Lines! This was the last bus available to take a church group to Whistler! This described the rest of our day. Free sailing, till our first road block. What kind of Fun adventure would this be? Who could the celebrity be? So we followed behind this entourage! Escorted to Whistler...we felt privileged. They have washrooms, don't they? "Oh, yes, Madame, only for emergency." Shucks, no more coffee for me. Upon arrival we noticed the Olympic rings. 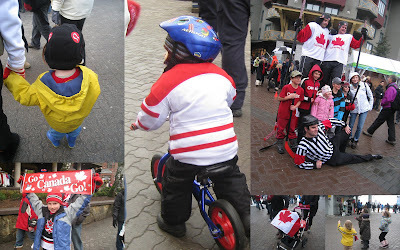 on Feb 12, 2010, the beginning day of the opening ceremonies. My heart cries for his family, for his team, and for his country. There was energy and buzz all over the village. I was ecstatic, texting, everyone I knew could understand text. I, of course had the fun of playing paparazzi. 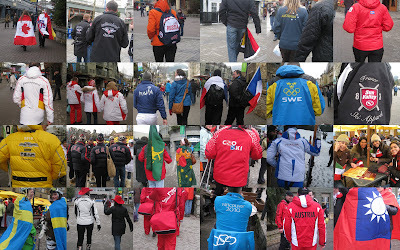 from which we encountered athletes and representatives. I loved catching the energy of the little ones. Parents and children enjoying the Olympic spirit. And guess who I saw at the end of the day. And he said, Hello to us! "You don's mess with security." that have effected Canada for the rest of our lives. Only to mention two Olympic Golds on Canada's territory. This was a dream, come true, indeed. This was truly One Unforgettable Day! That definitely sounds like a mountaintop birthday to me! What a great way to remember the birthday of 2010. May the road ahead be free of roadblocks...and lead to many more wonderful experiences. Now that is what I call a birthday to remember! I am so happy for you! What a wonderful Birthday experience for you! I love how you made a collage of all that country garb! Love it. Wow - you really know how to celebrate a birthday! I'm enjoying reading about bloggers' visits to the Olympics and hearing from my daughter who is working there - what an experience! Wow....what a great birthday. Cool that you mixed with dignitaries! Lucky you. I am surprised you got such a great shot....AND were allowed to keep it. Well done! Nice that he said hello...and on your special day! So you were the one who broke security and got too close to Joe Biden? LOL. Looks like an exciting, incredible birthday! How I would love to be there! Marg. .you really did have an amazing day and I'm so glad for you. I could almost see you taking notes of the countries that you had talked to someone from. Good celebrity sighting too. .once in a lifetime no doubt. Wow! What a great birthday! What a fun birthday you had Marg! I like Joe Biden ..he's a nice "down to earth" kind of man. It was very sad about that athlete from Georgia. Some sports are dangerous and the luge is one of them.